Monday, July 24 we returned to St Mary’s for Dave’s VA yearly physical. This is a new clinic for him and he really liked the doctor. He found out he DID have shingles on his forehead, which is what we suspected. They recommend he see an eye doctor to be sure there hadn’t been any damage to his eye. Thursday, July 27, I saw a new physician in Brunswick. Since Dave will return here for his yearly exams, and we weren’t returning to Rapid City this summer, I decided to find my own doctor here. The office I chose had me fill out all of my medical history online and send it to them to review before they would accept me as a new patient. That was something new to me. I guess I passed their test. The rest of our time this month was spent on routine things or boat projects. Here are some of the things Dave worked on. Dave measured the fuel in our tank after we arrived at the marina. 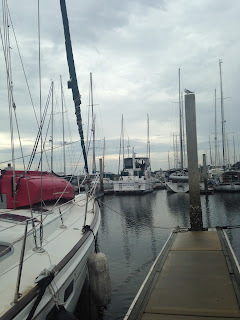 We arrived at the marina with a low amount of fuel on purpose, which isn’t usually a good idea because you can have crud in the bottom of your tanks. But we have a good filter system and try to keep our fuel clean/polished. Dave used our fuel polisher as a pump to remove the rest of the fuel from our tank and put it in the jerry cans. Then he filled the tank and was able to measure exactly how much it held, which was 58 gallons. Since we usually use our jerry cans in multiples of 5 gallons, he is just going to figure we have a 55 gallon tank. Good to know. The SSB radio was not transmitting as good as it should because the signal wasn't being reflected into space. Dave had added a bigger grounding plane which caused trouble with transmitting. That was from running the copper foil earlier this year. So he disconnected the copper foil and went back to the original system. He added ferrite chokes to all the wires for the SSB. It restricts stray radio frequencies. Once we were back, he ordered SWR meter and a dummy antenna load to be able to test the system. Now he can monitor the SSB with the meter if there are changes in the future. We now have excellent transmission power. The galley sump pump had stopped pumping the last time I defrosted the freezer. So Dave ordered a kit to repair it. After placing the repair kit, water was spraying out everywhere. So Dave watched a Youtube video about putting this repair kit in this pump. The guy had the same problem and ended up using a sealant to stop the leaking. Both he and Dave noticed the gasket didn’t have the same holes as the old one. Both thought it must be an upgrade. And both put the kit together several times in different configurations and still had leakage. The video guy used a sealant and said he was going to contact the company. 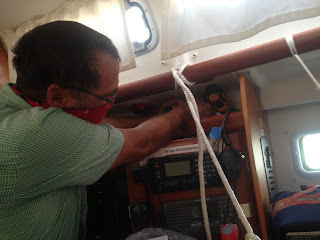 Dave ended up making his own gasket out of gasket repair materials that he had on the boat. Now it is working and I will test it when I defrost the freezer again. Nothing is simple. There is a cruiser’s net on the VHF radio here 3 days a a week. I helped start it 2 years ago with 2 other boaters. So it was nice to see that it was still going. And I have volunteered to be a net controller one day a week while we are here. Someone was looking for a couple extra fenders for their boat. We told him we had a couple in our storage unit and would get back to him. 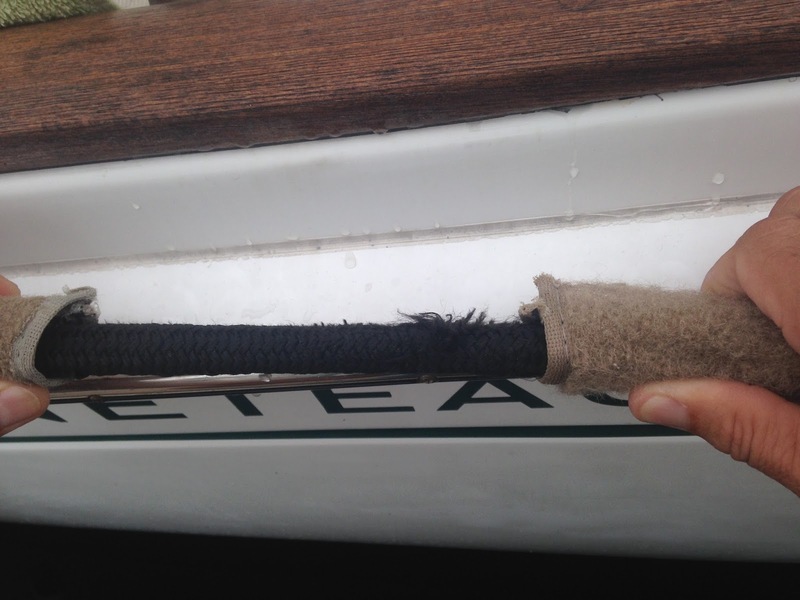 Well the day we brought them to our boat, one of our 4 fenders was flat. 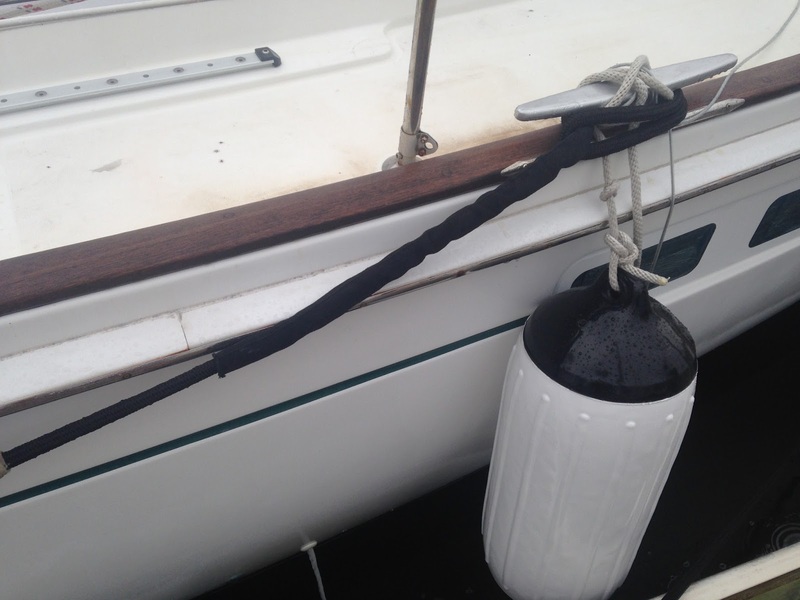 West Marine replaced the damaged fender, but that got us thinking about hanging on to or spare fenders. They are good to have in a crowded anchorage if there is rough weather. Or in a marina if you have someone with sloppy skills in the slip next to you. In our heads, there is a “Y valve” that changes the hose from either having your waste go into a holding tank or overboard. When we are in the Bahamas, it is in the overboard position. Now I know some of you reading this will go “ewww!”. But with the tidal motion of the water, the area is constantly being “flushed”. Plus there aren’t any pump out facilities in the Bahamas. Of course, you don’t pump overboard if you are in a crowed harbor. Anyway, Dave was reading that you should occasionally move that valve to keep it free moving. Salt crystals build up from the combination of your pee and the sea water being used to flush the toilet. When he did this while we were in the Bahamas, the valve was stuck. When he moved it, he could tell the rubber seals or o-rings were damaged. We were able to function as it was, but it needed replacing once he could get new parts in the states. Looking at repair kits vs replacement parts, the cost isn’t that much different. So he bought both. He put in the replacement parts and will now have a repair kit for the future. In all of this, he learned that you need to keep those parts moving to avoid problems. We picked up a used Portland Pudgy dingy while we were in the Bahamas this year. This is a dinghy made from a hard repairable plastic similar to kayaks. We didn’t need a second dinghy, but we do need a life boat if we are going to travel beyond the Bahamas. The Portland Pudgy has accessories that can be added that will allow it to be a sailboat and a lifeboat. We really miss sailing for fun. This will give us a little boat to “play” with when we are at anchor. There is a lot of information about making this a life boat, which I won’t go into here. We were planning on ordering things when we were back at the boat in late August. But Dave happened to see online that they were going to have a significant price increase in August. So Dave spent a couple days trying to get a hold of someone on the phone to purchase what we wanted. Whew, crazy how those things work out. Only one part was back ordered, and we’ll have to pay the new price when that is charged later. Dave is planning to sew a few things this fall. So he spent some time measuring and ordering material. We will take our sewing machine to the yacht club building and work on things there with more room air conditioning. We spent the last few days of the month preparing the boat to be left here for 3 weeks. We are going to SD, MN and WI to see both sides of our families. We will shut off the refrigerator and microwave. So I have been managing our meals around using what we have onboard. That also means I have to defrost the freezer. I sealed open containers of food in ziplock bags or tossed it out. I thoroughly cleaned the galley. You don’t want to attract critters while you are gone. We’re not removing the bimini and dodger because hurricane’s typically don’t hit this area in August. They are usually more active last September and October. But you never know. Dave put an extra tie around our jib sail vs taking it off. He put out all 6 fenders and extra spring lines to the dock along with anti chafe gear to protect the lines. We are on floating docks, so if the tide or surge goes higher, our dock and lines will go higher, too. The worst case is if there is a 10-12 foot surge, the docks will float off of the pilings. If there is going to be a hurricane directly in this area, we will change plans and get back here to stabilize the boat further. Dave ran both the Yanmar diesel engine and the generator diesel engine. Then he closed all the through hulls to avoid any water coming in through those fittings. He flushed the air conditioner. We will shut it off and run a dehumidifier. We will open a lot of the cabinetry to help reduce moisture. I’m sure there are other things, but those are the major projects. On the last Sunday of each month, the marina has a potluck dinner at the Yacht Club. On Sunday the 30th, the optional theme was Oriental. Since we were leaving on Monday, we bought frozen pot stickers. Only problem was timing the defrosting of the freezer and keeping them frozen before we prepared them for the dinner. Everything will work out fine. I will post this before then, so take my word for it. Dave's comment on boat work "I'm not sure I would get anything done if I hadn't learned how to swear."